ADDITION Valentine's Math Games, Centers, or Activities | Make a FUN Card! 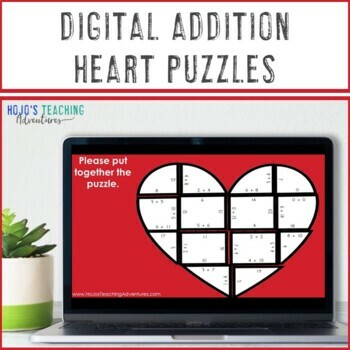 These addition heart math puzzles make it quick and easy for teachers to provide hands on games that meet the needs of all students. Use them for Valentine's Day, Mother's Day, Father's Day, Grandparents Day, or anytime you want to show the love. They work great as activities, centers, stations, or games. With a no prep option - these are the perfect last minute resource for your 1st, 2nd, or 3rd grade students! WANT TO SAVE SOME MONEY? Grab my ADDITION HOLIDAY & SEASONAL MATH CENTERS BUNDLE to save over 30% and have great downloads to use all school year long. 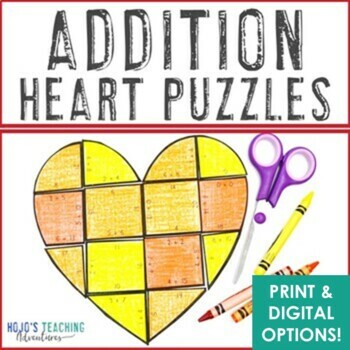 CHECK OUT THIS EDITABLE HEART PUZZLE SO YOU CAN MAKE YOUR OWN ACTIVITY ON ANY TOPIC! • This was an engaging center activity that my students loved. • These puzzles have been a HUGE hit! • This was a great activity to send home in our weekly Math bags! 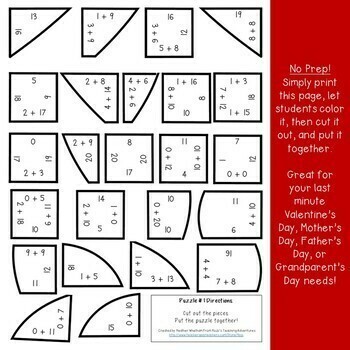 • This was an awesome challenge to my students and a fun way to incorporate our Valentine's Day festivities into math! • Great activity for grandparents/someone special day. If you want an addition puzzle you can use at ANY time of year, check out this set of Addition Magic Square Puzzles. There are three heart puzzles included in this download. Plus you also get a NO PREP option of each of those puzzles. This means there are 6 total puzzle options! Choose which option works best for your students. 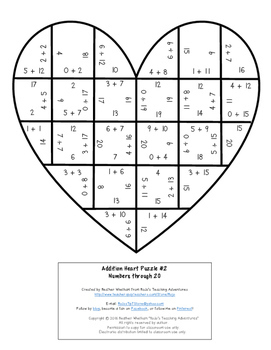 Use these puzzles anytime you need a fun math activity - particularly for Valentine's Day or to show the love. These puzzles are meant to be somewhat of a challenge - which is perfect to promote a growth mindset. Students will have to keep in mind the shape of the heart and persevere if the task seems challenging. Tell students to rotate the pieces around and analyze what they can do differently until they fit. This is where their critical thinking and 21st Century skills will come into play! Answer key included! Correcting is easy when you use the original fully formed heart to ensure all the numbers are in the correct order and the shape is fully created. LIKE WHAT YOU SEE? Click here to follow my store so you get updates of new resources, sales, and more!